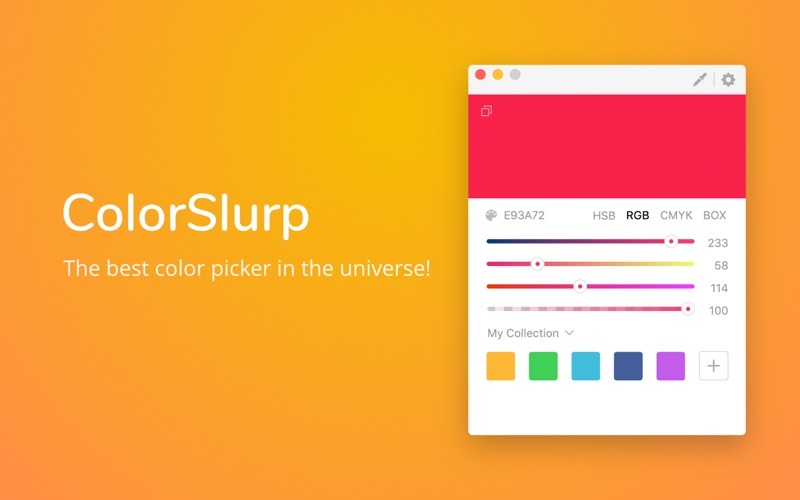 ColorSlurp is the ultimate color productivity booster for designers and developers. 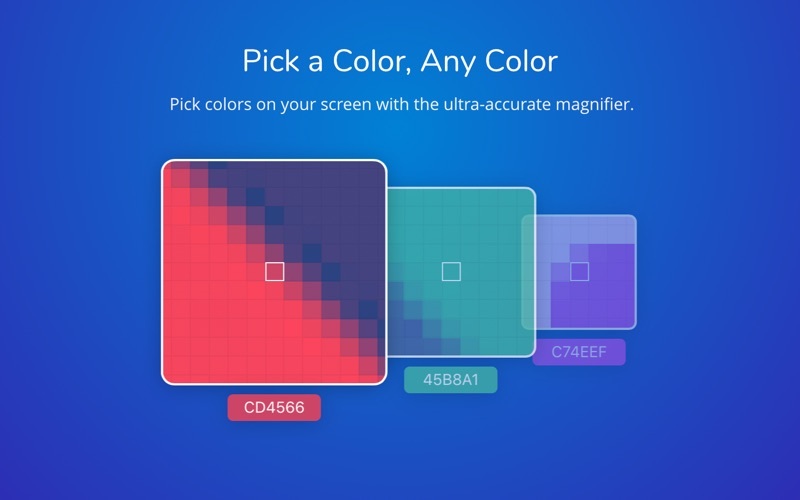 • Pick colors on your screen with the ultra-accurate magnifier. 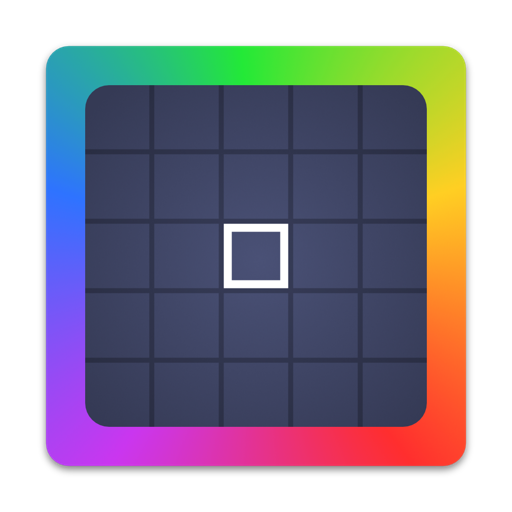 • Create and edit colors using an assortment of color selection tools. • Copy colors to a variety of color formats. • Organize your colors into collections. • Quickly access recently picked colors and swatches. • Work faster with customizable shortcuts. • Authentic slurp sound when picking colors! Ultra-accurate. Move the magnifier with your cursor, the arrow keys, or hold shift to slow its movement for pixel perfect precision. You can also hold command when picking a color to quickly choose which copy format to use. ColorSlurp supports 20 color formats to use in your projects. 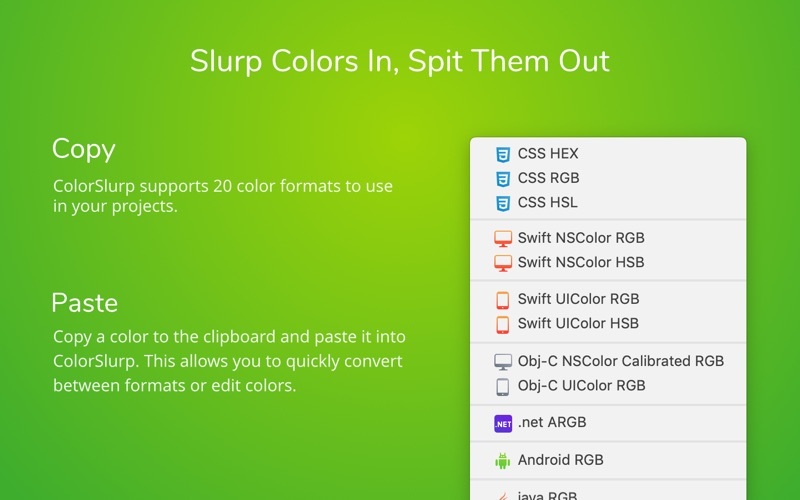 Copy a color to the clipboard and paste it into ColorSlurp. 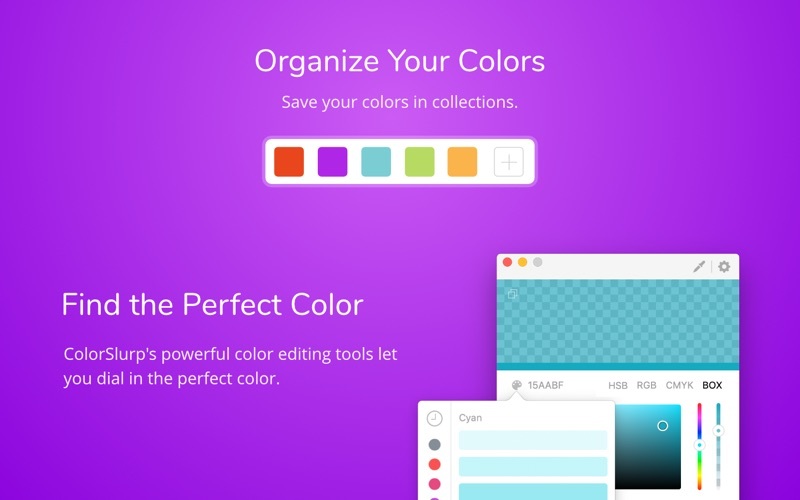 This allows you to quickly convert between formats or edit colors. Collections are groups of colors. You can create as many collections as you need to keep your colors organized. 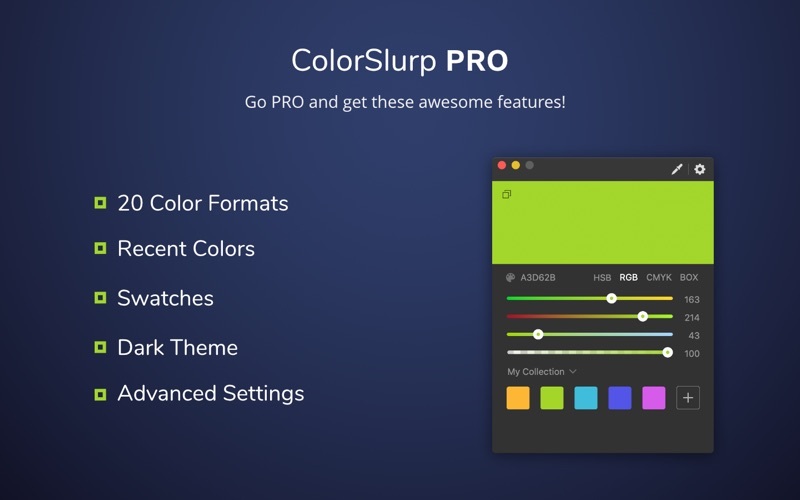 ColorSlurp's powerful color editing tools let you dial in the perfect color. Access your recently picked colors or quickly grab a predefined color from the swatches. Go PRO and get these awesome features! • Double-clicking on a saved/recent color will copy it to the main format. • Default shortcuts. 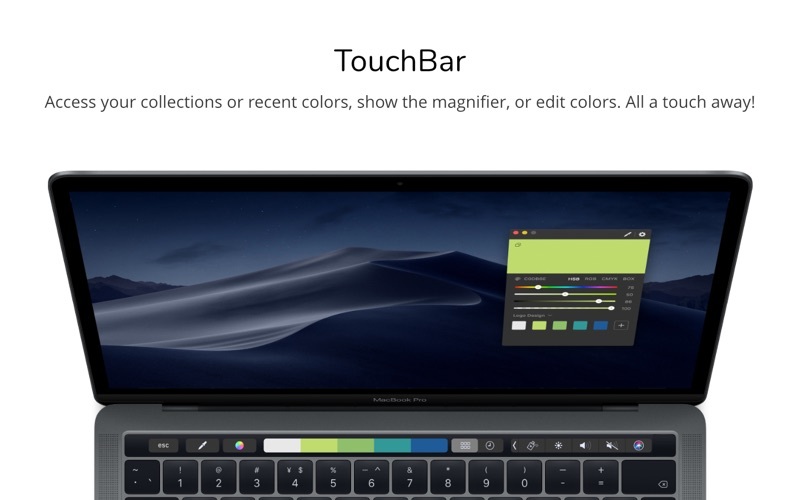 All editable shortcuts will now have a default shortcut if not already changed. • The magnifier outline now matches the theme of the app. If you enjoy using ColorSlurp, please write a review! • Copy notification. Shows a notification below the menu item with the copied color and format. • Copy notification sound. Plays a sound when copying a color. You can change the sound or turn it off. • Right click on the menu item to show the magnifier. • You can now adjust the magnifier's size and zoom with the scroll wheel. Scroll to change the size. Hold option while scrolling to change the zoom. • Support for multiple displays.